Powers/Abilities: The Human Robot was composed of artificial materials, making it superhumanly durable and strong (class 10?). It could also absorb and release electricity. Its capabilities were limited by its incredibly literal programming, which forced it to do only what it was commanded to. (Agents of Atlas I#6 (fb) ) - Commissioned by Plan Tzu M-11 was built as part of a plan to establish his unwitting successor Jimmy Woo as a hero. 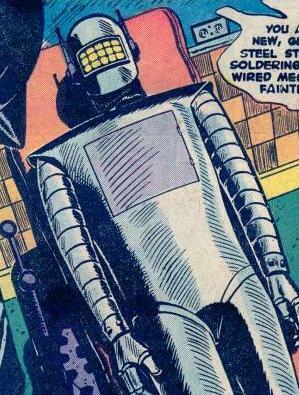 (Menace#11)- The Human Robot was built by an unidentified scientist, under the guidance of his business manager. The scientist programmed the robot so that it would only respond to commands given on its secret frequency. He tested the robot out, ordering it to pick up a chair, and the robot did so-- but then lifted another chair, unable to differentiate between plural and singular. The scientist deactivated the robot for later work. That evening, the business manager broke into the lab and set the robot up so that he could control it. He was tired of the scientist, who refused to speed up the robot's production, and believed that it was already set for release to the public. The following day, the scientist was about to install a regulator to control the robot, when the manager ordered the robot to "kill the man in the room"; it did so, strangling its creator. The manager entered, pleased-- and then the robot strangled him. It then set off to find more men in rooms to strangle. --old origin. As of Agents of Atlas I#6 M-11's origin was retconned a bit. (Agents of Atlas I#6 (fb) ) - Mr. Lao wanted the robot ready for missions the next morning, but the scientist wanted M-11 to have a choice. The scientist ordered it to kill him him with electrical blast in hope that some of his life force would become part of M-11's programming. It worked and M-11 now possessed a free will and emotions. (Agents of Atlas I#1 (fb) - BTS) - After his creator's death M-11 walked into the sea. (Agents of Atlas I#1 (fb) ) - Namora found M-11 undersea and offered it to Jimmy Woo, who was putting together a team to save President Eisenhower. Marvel Boy (Grayson) restored M-11 with Uranian know-how. Along with the G-Men M-11 attacked Yellow Claw's Mongolian fortress. They easily went through his soldiers, but inside they were nearly overpowered by Voltzmann's Shadow Warriors. Marvel Boy saved his teammates and M-11 captured Voltzmann, but Yellow Claw and his niece Suwan were already gone, despite transmitting their holograms from their escape vehicle. President Eisenhower was saved and the G-Men brought him back to the United States. (Agents of Atlas I#5 (fb) - BTS) - One mission led the G-Men into San Francisco's bay area. (Agents of Atlas I#1 (fb) - BTS) - After six months activity the G-Men were disbanded. (Agents of Atlas I#6 (fb) - BTS) - The Atlas Foundation retrieved M-11 after Grayson had returned to space and the robot stayed with them. It let them make more improvements on him enabling the robot to access any computer network on the planet. And Mr. Lao put a restoration enchantment on the robot in case of destruction. (Agents of Atlas I#3 (fb) - BTS) - Decades later Gorilla-Man met M-11 during a recon mission for SHIELD. The robot told him about Woo's critical condition. It requested Hale's help to retrieve Woo from SHIELD's Mojave Base and to call Marvel Boy (Grayson) for assistance. (Agents of Atlas I#1) - M-11 worked together with Gorilla Man to break out the heavily injured, aged Jimmy Woo. They escaped in Marvel Boy's flying saucer. Inside the ship M-11 witnessed how Uranian technology restored Woo's body to a youthful and healed state (and a bit of memory loss). (Agents of Atlas I#2) - M-11, Gorilla-Man, Marvel Boy and Woo caught SHIELD agent Derek Khanata when his investigations brought him to Woo's house. They took Khanata with them to Africa to pick up Venus. Through M-11's eyes Golden Claw had watched every move Woo and his team made and finally attacked them with a robot duplicate of himself and some Automatons in Africa. (Agents of Atlas I#3) - M-11 accompanied Venus, Derek and Kal'ti while the others defeated Golden Claw's robots. The team returned to San Francisco in Marvel Boy's flying saucer. Woo remembered how he hand-picked the team and Khanata pointed out that M-11 wasn't picked by him, but brought to him by Namora. In San Francisco the team returned to the place where Woo accessed the underground with his killed team, but they found nothing special there. M-11 later told his team that Namora wasn't dead and gave them the coordinates where to find her. They found Namora's coffin. (Agents of Atlas I#4) - Golden Claw watched through M-11 how Woo's team found Namora. Marvel Boy realized that the dead Namora was an illusion. M-11 freed Namora from the block of ice she was in while the rest fought giant crabs. Namora helped when she was free again and later thanked M-11 and joined Woo's team against the Atlas Foundation. M-11 was instrumental in taking down several operations of the Atlas Foundation including Atlas Nursery, Atlas Mortuary, Atlas Biotech, Atlas Orphanage and many others. During a break on a Fiji island M-11 made a fire to grill fish. The team was attacked again by Golden Claw -- using animated Terra Cotta Warriors. They left after defeating them and Woo finally realized that someone among them was a double agent. (Agents of Atlas I#5 (fb) ) - Woo told Khanata that M-11 had to be an agent of Golden Claw because he was always the last to arrive when Claw attacked them. Woo was sure Claw orchestrated his return with M-11's help. (Agents of Atlas I#5) - Woo's team went to San Francisco's bay area to an inactive shipyard. There M-11 was attacked by SHIELD agents, but Venus knocked them out. Venus snapped upon realizing what she really was (after hearing Namora's story about the legends of a Naiad, who had been turned into a human). Upon listening to her scream, the whole team learned from Khanata's memory that M-11 was a traitor. Marvel Boy (Grayson) destroyed M-11, but the robot rebuilt itself while the others had to fight Namora, who got really mad over M-11's destruction (because the robot remembered her when nobody else did). Woo asked the rebuilt M-11 to sever his connection to Golden Claw and the robot did it because it was part of Woo's team. M-11 then showed the team footage of Woo's last SHIELD mission that revealed that the Atlas Foundation had also an agent in SHIELD. Woo and Marvel Boy weren't too surprised when they found out that M-11 was built by the Atlas Foundation (inside his chest cavity was a part by Atlas Semiconduction). (Agents of Atlas I#6) - After reviewing the footage played to them by M-11 again, Woo returned with his team again to San Francisco and the place where he was nearly killed. With the right password (Master Plan) an elevator brought them down to a hidden temple where the dragon Mr. Lao attacked them like Woo's SHIELD team before. Protected by M-11's energy shield the team survived and finally learned that Woo was a descendant of Golden Claw and therefore also of Ghengis Khan. Woo became the new COE of the Atlas Foundation and Golden Claw was consumed by Mr. Lao. M-11 stayed with the Agents of Atlas. (Spider-Man Family#4/2) - The Agents of Atlas watched Spider-Man chase a creations of a rogue, occult Atlas branch. They later worked together with Spider-Man to defeat the branch, that viewed the Agents of Atlas as usurpers and planned to oppose them with totemic automatons empowered by stolen human life forces. Afterwards Marvel Boy made Spider-Man forget them and he only remembered them as the Agents of Butterfly. (Secret Invasion: Who Do You Trust?#1/5) - During the "Secret Invasion" Gorilla-Man and Human Robot freed a captured Namora from the Skrulls at Pox International Airport and kidnapped one of them. The Skrulls eventually found their ship and attacked, but the Agents of Atlas fought back and in the end the Human Robot was ordered by Woo to use his Death-Ray and all attacking Skrulls were killed. The Agents of Atlas then began to plan their underground movement against the Skrull invasion. Comments: Created by Stan Lee and John Romita. In Thunderbolts I#29, Machine Man had a bust of the Human Robot's head on his mantel, next to Ultron and Robotman (of DC's Doom Patrol). (What If I#9 (fb))- However, it did not get far, and fell into the sea where it was short-circuited by water. (What If I#9)- Some time later, it was found by Namora while searching for her lost cousin, the Sub-Mariner. She helped the 3-D Man recover it from the sea so that it could serve as a member of the Avengers, a team of superhumans being gathered by Jimmy Woo of the FBI. Just as the 3-D Man returned the robot to the surface, he was distracted by the goddess Venus, and the Human Robot came back to life, still following its order to kill. Fortunately, Venus was able to halt its attack by using her power of love upon it. The final two members of the Avengers, Marvel Boy and Gorilla-Man, then arrived, and Marvel Boy set about to repair the Human Robot and install a regulator. When the process was complete, the Human Robot was welcomed into the Avengers. After learning from Suwan (niece of the Yellow Claw) that Jimmy Woo and President Ike Eisenhower had been captured by the Yellow Claw, the Avengers set off to combat him and his team of superhuman villains. The Human Robot smashed an opening into the Yellow Claw's base, but was almost immediately frozen solid by the Cold Warrior. However, the 3-D Man tricked Electro into blasting the Human Robot with a stray jolt of electricity, and the robot was freed. It confronted Electro and absorbed some of the power then released it back at him, short-circuiting him. The President and Woo were both rescued, and Woo set after the Yellow Claw, only to find a dummy planted with a bomb in his place. The 3-D Man pulled Woo to safety while the Human Robot took the brunt of the blast. The 3-D Man feared that the robot had been destroyed, but it survived. The Yellow Claw, meanwhile, escaped. Afterwards, the President disbanded the Avengers, afraid that their presence would upset the American public. The Human Robot's fate since then is not known. A note on the Avengers of the 1950's (Earth-9904): In the Avengers Forever limited series they were seemingly ret-conned out of existence. However, in a personal communication with Kurt Busiek (on Avengers Message Board), he specifically stated that he did not wipe the Avengers of the 1950s from existence. One alternate timeline containing them was wiped out. The group may well have existed in the mainstream past, but they just weren't called the Avengers. He suggested the name: "The G-Men".